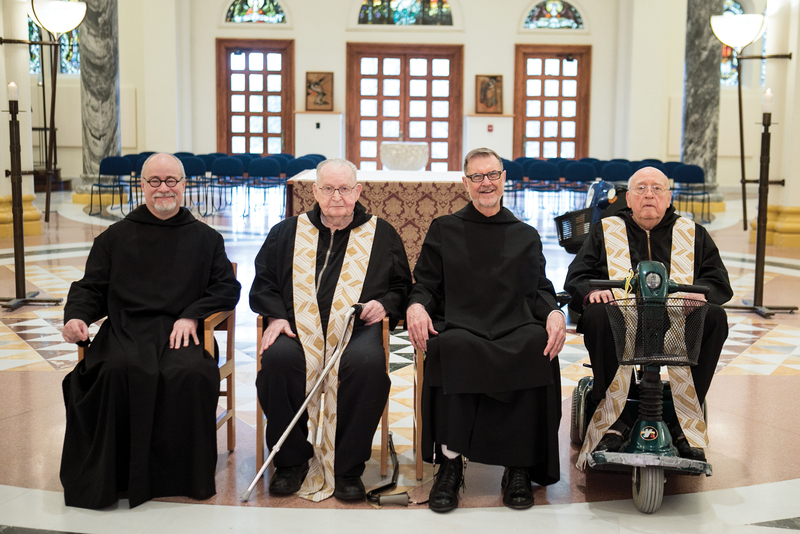 The Benedictine monks at Saint Meinrad Archabbey in St. Meinrad, IN, celebrated the priesthood ordination jubilees of four of their confreres on May 27, 2018. Honored were Fr. Bonaventure Knaebel, 75 years; Fr. Columba Kelly, 60 years; Fr. Noël Mueller, 50 years; and Fr. Denis Robinson, 25 years. Fr. Bonaventure was born in New Albany, IN, on September 6, 1918. He professed his monastic vows on August 6, 1938, and was ordained to the priesthood on June 5, 1943. This year also marks the 80th anniversary of his monastic profession and his 100th birthday. He attended minor and major seminary at Saint Meinrad and then earned a Master of Science degree in 1946 from The Catholic University of America. He served as archabbot of the Saint Meinrad community from 1955 to 1966. He was the first Hoosier native to lead the monastery and, at 36, one of the youngest Benedictine abbots. Other assignments have included teaching in Saint Meinrad’s high school and college, assistant spiritual director at Saint Meinrad School of Theology, assistant manager at Abbey Press, and eight years as a missionary at Saint Meinrad’s mission in Huaraz, Peru. Fr. Bonaventure has served as pastor at Sacred Heart Parish, Jeffersonville, IN, and St. Michael Parish, Charlestown, IN. He has been the administrator of the Benedictine monastery in Morelia, Mexico; Corpus Christi Abbey in Sandia, TX; and St. Michael Parish in Bradford, IN. He also served as a chaplain at St. Paul Hermitage, Beech Grove, IN. Fr. Columba is a native of Williamsburg, IA. He professed vows on July 31, 1953, and was ordained to the priesthood on July 5, 1958. He graduated from Saint Meinrad College and then earned a Licentiate in Sacred Theology from Sant’ Anselmo in 1959. He then studied at the Pontifical Institute of Sacred Music in Rome, earning a doctorate in 1963. Fr. Columba was the monastery choirmaster for many years, beginning in 1964. During that time, he began composing English-language chants based on the principles used to create the original Gregorian chant repertory. That same year, he began teaching in the Saint Meinrad schools. Fr. Columba served as prior (second in leadership) of the monastery from 1978-84. He taught summer sessions at the St. Joseph College Liturgical Music Program in Rensselaer, IN, from 1964-72. He has led numerous workshops on chant throughout the United States, at the Abbey of Solesmes in France and for Benedictine communities in Australia. In 2015 he was named only the second recipient of the Spiritus Liturgiae Award, given by the Liturgical Institute. In addition to composing, he gives workshops and publishes extensively in scholarly journals. He also has written two books on chant. He is an adjunct faculty member at Saint Meinrad Seminary and School of Theology. Fr. Noël is a native of Louisville, KY, and he professed his monastic vows on August 15, 1963. He was ordained a priest on September 22, 1968. From 1969 to 1980, he served at Saint Meinrad’s mission in Huaraz, Peru, teaching English and religion and serving as coordinator of both the Office of Liturgy and Marriage Encounter in the Diocese of Huaraz, as well as other duties. He earned a master’s degree in English literature from the University of Louisville in 1985 and taught for 13 years at Saint Meinrad College. He also has served as monastery guest master, as associate director of continuing education and associate dean for housing and food services for the School of Theology, and as the secretary to the archabbot. Currently, he serves as a formation dean in the seminary and as a spiritual director and retreat director. Fr. Denis is a native of Iuka, MS. He attended Saint Meinrad College and School of Theology, earning a bachelor’s degree in philosophy in 1989 and a Master of Divinity in 1993. From 1993-97, he was parochial vicar for the Cathedral of the Immaculate Conception in Memphis, TN. He joined the monastery at Saint Meinrad in August 1996 and made his solemn profession on August 15, 2000. Fr. Denis also attended the Catholic University of Louvain, Belgium, where he received a master’s degree in theology in 2002, a licentiate in sacred theology in 2003, and doctorates in sacred theology and philosophy in 2007. Since 2008, Fr. Denis has served as president-rector of Saint Meinrad Seminary and School of Theology. He is also an associate professor of systematic theology. Other assignments have included director of continuing education and director of the permanent deacon formation program at Saint Meinrad and subprior of the monastery.